In my City Talk column on Sunday — Is it time to talk traffic calming in downtown Savannah? — I focused entirely on Drayton Street and Whitaker Street. Many drivers on those streets greatly exceed the posted speed limit (35 mph for much of the time), and they aren’t going to slow down if the street design remains as it is now. After all, drivers will typically go faster when roads are straight and flat, when roads are one-way, when there is no on-street parking, when lanes are wide (typical freeway lanes are 12′, Drayton and Whitaker are 15′), and when there is little “visual friction” from streetscape elements like trees. We know from the nasty routine wrecks that drivers aren’t safe cruising faster than 35 mph on Drayton and Whitaker, but the street design deceives those drivers into thinking that they can safely go much faster. Even though there is plenty of room for bicyclists on Drayton and Whitaker, most of us avoid those streets like the plague. Pedestrians, too, avoid Drayton and Whitaker; the very elements that make drivers feel safer make pedestrians feel more imperiled. If we were starting from scratch, we would never design Drayton and Whitaker like they exist today. It’s long past time to get serious about changing them. With fairly straightforward changes, we can dramatically improve safety on those streets, and at the same time we can dramatically enhance quality of life for nearby residents and enhance the experiences of hundreds of thousands of visitors each year. At the end of the day, however, the most compelling argument for redesigning the streets might be a financial one. Public land has value. Used appropriately and efficiently, public spaces — including our streets — can enhance the value of neighboring properties, encourage development, contribute to the tax coffers, and promote neighborhood vibrancy. We simply don’t need two 15′ lanes on those streets, and the wasted space could be repurposed in ways that would generate many millions in economic activity each year. 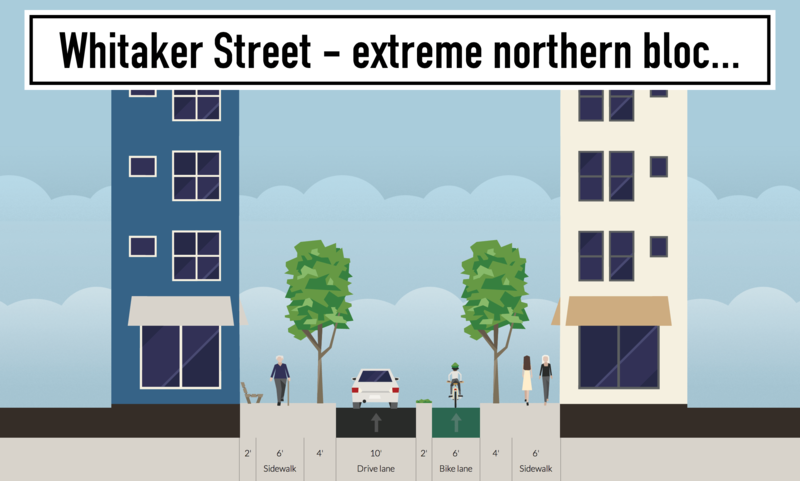 Let’s look at some images that I created using Streetmix. I’m sharing these under a Creative Commons Attribution-ShareAlike 4.0 International license. You are welcome to use them under the same terms. I should say right off the bat that pretty much all streets have some variation in width. 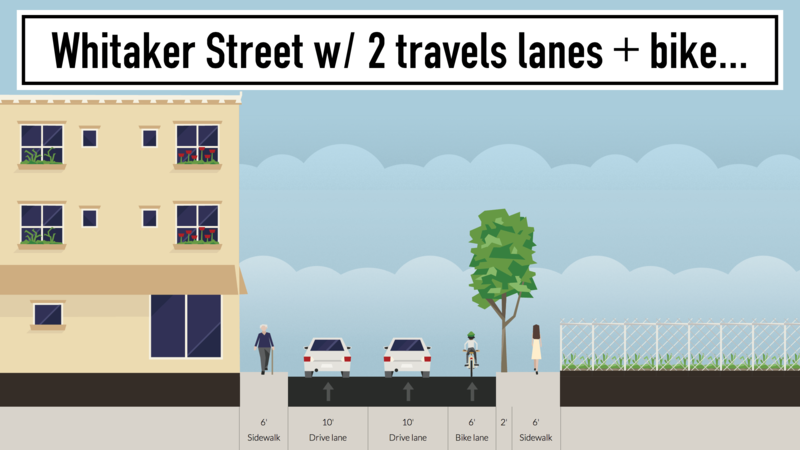 I’m working with a basic width of 40′ in most of these images and ideas — that’s the approximate width of the two lanes and the sidewalks along much of the street. Just keep in mind that the calculations might vary slightly from block to block, and, as I suggest near the end of the post, we don’t necessarily need to treat all blocks of Whitaker and Drayton the same. For the sake of simplicity, I’m focusing on Whitaker rather than Drayton, primarily because the northernmost blocks of Whitaker really do need a radical redesign. Also, really important: I am assuming that Drayton and Whitaker will continue to be one-way streets, but the best options might involve making them both two-way. And also really important: you might assume that wider lanes are safer lanes, but the evidence does not support that conclusion. Drivers travel more slowly and carefully in narrower lanes, and even if certain types of wrecks increase on narrower roads, those accidents are much less likely to be catastrophic because the speeds are lower. 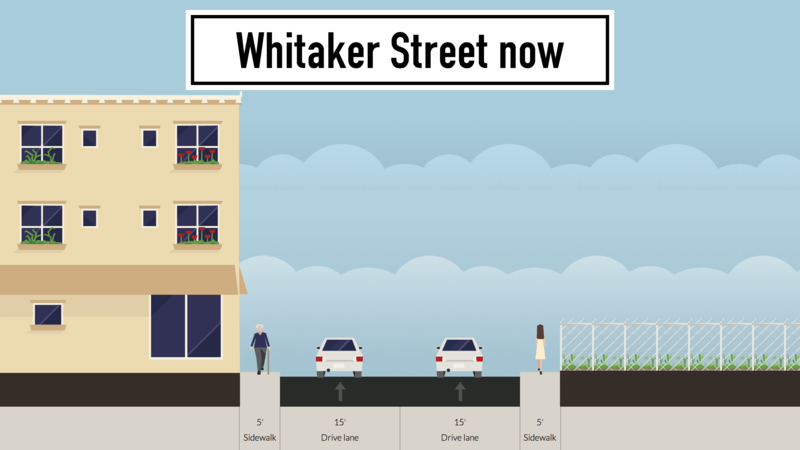 So here’s what Whitaker looks like now — two overly wide travel lanes and absurdly narrow sidewalks. Next is a pretty minor redesign, although this would definitely cost some money since it involves devoting a significant amount of the road surface to the sidewalks. 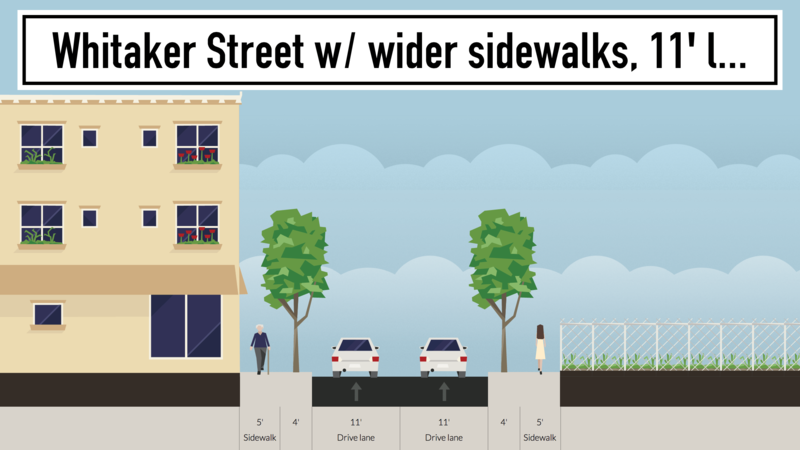 Nothing ambitious here, however — we make the sidewalks safer, beautify the street with trees, slow traffic because of the narrower but still perfectly wide lanes, and, maybe most critically, improve the visibility of drivers at the stop signs on the cross streets. I would suggest that some stretches of Drayton and Whitaker don’t really need two vehicular travel lanes. 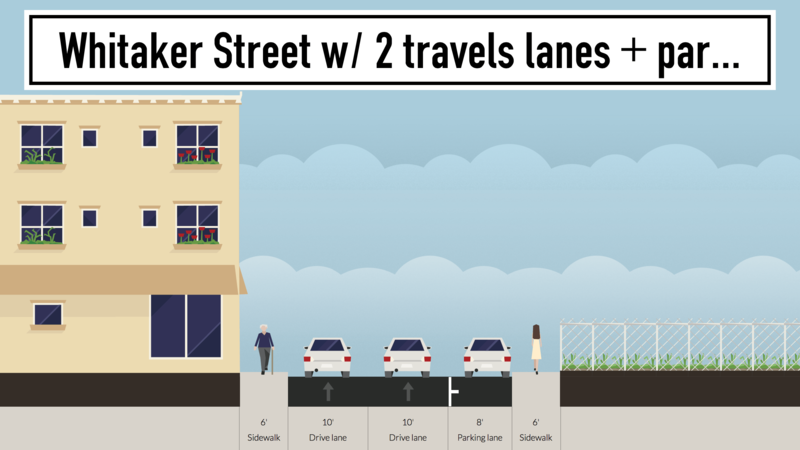 These are more radical options — 1 travel lane, 1 bike lane, on-street parking, and wider, safer sidewalks. In one, I’ve put the bike lane next to the parked cars like on Price; in the other, I’ve used the parking as a buffer to protect the bike lane. As I said above, there is no reason to think that Whitaker and Drayton need the same design for the entire stretch from Victory Drive to Bay Street. The northernmost blocks of Whitaker — from Bay to Broughton — have a large number of pedestrians; many of them are patronizing popular restaurants and bars, while many others are just trying to get safely across the two travel lanes. But if you stand at the corner of, say, Whitaker and Bryan, you realize that the cars turning off Bay and turning out of the parking garage are only really using a single lane. We could and should dramatically reimagine those busy blocks — and we could turn a truly repellant street into a pleasant and comfortable one, including space for outdoor cafe seating and a protected bike lane. 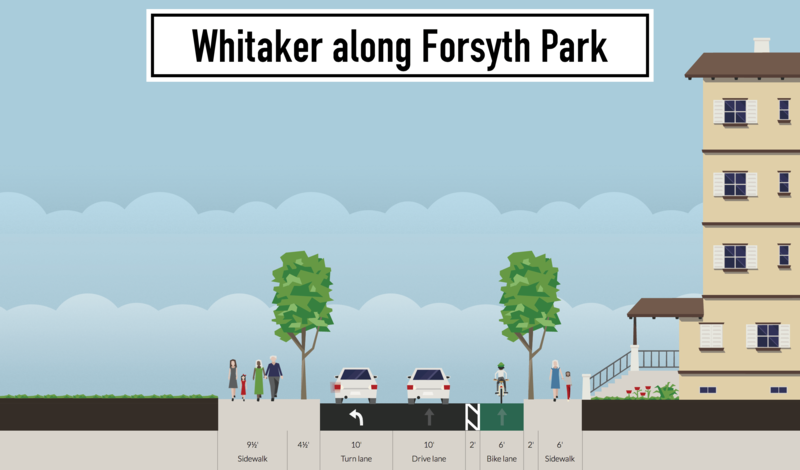 But maybe we need two travel lanes on other parts of Whitaker, especially around Forsyth Park. Here I’ve still made the lanes narrower — again, that’s a no-brainer — but the left lane here is a dedicated turn lane onto Park Avenue, while the buffered bicycle lane will also make it much safer and more pleasant for pedestrians on the west side of Whitaker. After narrowing the lanes, I was able to widen the western sidewalk by 2′ and create a 2′ buffer for the bike lane. The presence of that bike lane would also make it much easier to reduce bicycle traffic in Forsyth Park. These are all just possibilities, but any and all of them are better than what we have now. ← What are the chances that Edna Jackson will be reelected mayor of Savannah? what happened to the simple concept of putting speed bumbs in the road. If that does not slow down traffic at least the auto shops will have some income on fixing broken axles. With target speeds of 30-35 mph, Whitaker and Drayton wouldn’t really be good candidates for speed bumps or speed humps (wider and less abrupt than bumps), I don’t think. Also, emergency vehicles will continue to use those streets regularly, which would be another reason not to use speed bumps. But there are perhaps other streets downtown where their use would make total sense. Small point.. But EVERY Oak Tree along this rout extends say what 8-12 inches onto driving lanes. Also the proximity of the buildings to the street offer some visible interference but it does not appear to slow southbound traffic. There are street trees along the east side of Whitaker beside Forsyth Park, but there are only a few on the west side of the street, and many blocks of Whitaker have no or few trees. The trees that are there certainly provide some visual friction though, as do the buildings. I agree that these elements don’t seem to calm traffic — the unusually wide, flat, straight lanes trump everything else. Mr. Dawers, I wonder what the city traffic engineering staff thought of your idea. Did you get their opinion or consult with them in any way? On the FHWA website you can obtain eligibility requirements for traffic calming. It states “Functional Classification = local residential or minor collector”. Whitaker and Drayton are classified as arterials so it would be against federal guidelines to install traffic calming on these streets. Because these are arterial streets for a reason, I wonder if installing traffic calming on them would then force traffic on smaller residential streets to avoid the calming. I undersatnd you are a journalist. What credentials do you have to put forth these suggestions? You never mentioned consulting a professional engineer about this, did you? And lastly, are you the gentlemen we recently saw measuring Whitaker street with a wooden fold up ruler? I am looking forward to your responses. That was probably me with the measuring stick — I just wanted to confirm previous measurements. I’m actually not proposing that we install any sort of traditional traffic calming devices (i.e., speed bumps, etc.). I’m just talking about not having 15′ wide lanes and having a street design that is safer for pedestrians and probably for cyclists too. Go to this page at the FHWA website: http://safety.fhwa.dot.gov/geometric/pubs/mitigationstrategies/chapter3/3_lanewidth.cfm As you can see there, urban arterials can be 10′ wide. You won’t find advocates for 15′ lanes anywhere. Obviously, before making any radical redesign — like eliminating an entire lane — we’d need to look closely at traffic counts, alternatives, etc., etc., but there are numerous highly placed public officials in Savannah (who so far haven’t chosen to go on the record) who favor just that sort of major redesign for parts of these streets. Changes to the north end of Whitaker, which I specifically mention in this post, have been under consideration for years. I have been writing about issues related to city life, urban design, business development, and all sorts of related topics for 15 years. And many traffic engineers would reflexively oppose any change, but many urban planners would — and a few already have — approve of various ideas set forth here. Thank you Bill for this article and the well studied suggestions or recommendations. You are right, something needs to be done to calm traffic. (Wish you’d study E 52nd where I live!) I would like to see a bike lane added, but no parking due to the dreaded “door zone”. People ride through Forsyth Park illegally and a bike lane would reduce that, and the potential for injury to pedestrians. A well thought out re-design, with input from citizens, is a great idea and I hope the city will move forward with something. I ride pretty fast on my bike, but I don’t dare ride on these streets around the park. Great points. And it’s actually a violation of state law to ride one’s bike on the sidewalks around Forsyth Park, although I tend to do it late at night when the park itself is “closed” — I would certainly ride on Whitaker and Drayton if it were safe. I don’t ride fast, so I’m personally less concerned about the “door zone” and some other issues, but that’s obviously an important issue. I have never looked into that (not even aware of the problem). I will see if the Savannah Bicycle Campaign has made any effort to address that problem. Thank you for putting this together. How did you create the visuals? What I a left with is to be sure I travel 35 MPH on these streets. My keeping to the speed limit will at lest be my part. And the police could start issuing speeding tickets and publish/broadcast the speed trap. Just hire Ryan Gravel and call it a day. Have thought about this many times ourselves since we live near Whitaker and Duffy. 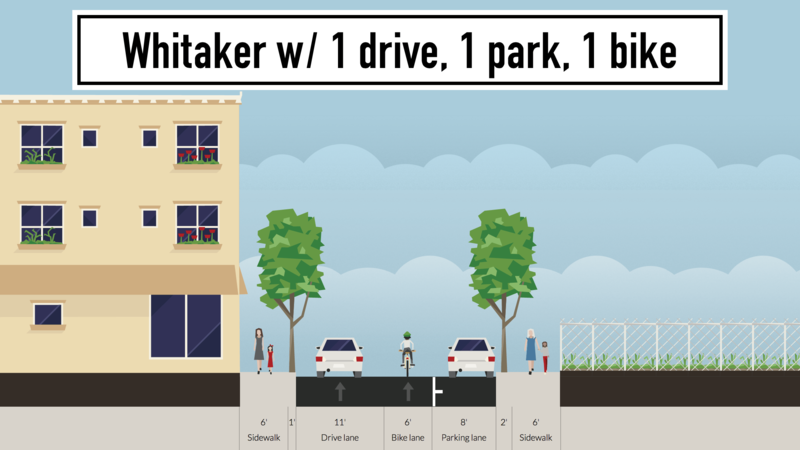 Extra parking is a great idea but we wouldn’t dare bike Drayton or Whitaker even with bike lanes. Motorist just get up way to much speed on these one way streets. If I could choose I’d say first where are the city police? They could make a fortune for the city simply enforcing the speed limit on these 2 streets. Secondly, if and when street cars ever make a comeback in Savannah wouldn’t one of these wide roads be much nicer for a streetcar than speeding cars?